Today, I would like to show you a resource published by the national film board (NFB). They are "hands-on workshops" that will let students discover the magic of filmmaking. The visual layout of the website is interesting but download speeds are terrible. In addition, videos are available as Real Player files instead of the popular format of Windows Media Player or Apple QuickTime. One of the most interesting activity on the website is producing animation movies using modeling clay. I have tried this activity myself in my history class and it was a success. The material needed for this activity is quite simple: modeling clay, a digital camera and movie editing software (such as Windows Movie Maker for Windows XP or iMovie that comes on the Mac). All your students need to do, is to build a background and make some characters using modeling clay. They take a picture (e.g. one every half second) and then slightly move the characters between each picture. Pictures are then imported in movie editing software where students can add voice, music and sound effect. Students just love this activity. Unfortunately, the website provides very little information on how to do it, but don't worry, it is very easy! 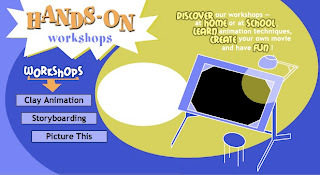 The site provides videos showing some sample projects. The site also includes a section on how to do a storyboard (a story, frame-by-frame of your movie with pictures) as well as "picture-this", a section where students can imagine their character based on their own style. You can also book a group go to the Film Board Archives at Richmond and John in downtown Toronto and do clay or painted-cell animations at a workshop there. May 16, 2007 at 4:18 p.m. This can also the interesting book to develop the sense of writing skills and build his confidence. November 26, 2011 at 5:26 a.m.